This course introduces students to the field of special collections librarianship. The goal is to provide students with an understanding of the concepts, roles, and organizational development of special collections; current issues, standards, and best practices; and the knowledge and skills needed by special collections professionals. Students will participate in classroom discussions, hear from special collections practitioners, engage in hands-on exercises, and learn about the evolving roles of—and challenges facing—special collections professionals. Topics to be covered include collection development, preservation/conservation, access and reading room procedures, collection security, donor relations and development, digitization, exhibitions, outreach and instruction, public relations, and reference, among others. The course is designed for new/early-career professionals as well as for those with an interest in special collections librarianship, who have not yet undertaken formal coursework. In their personal statements, applicants should describe any relevant training, education, and experience, noting how the course fits into their current responsibilities and career goals. Michael Inman teaches this course. The course title is changed to "Special Collections Librarianship." Susan M. Allen teaches this course. Alice Schreyer teaches this course annually (2009 excepted). Daniel Traister teaches this course, generally once per year. Daniel Traister & John Parker co-teach this course, as "Introduction to Rare Book Librarianship." Daniel Traister & John Parker co-teach this course, as "Introduction to Rare Book Librarianship for Archivists." Daniel Traister & John Parker co-teach this course, as "Interpreting Rare Books and Manuscripts to their Community." Michael Inman is Curator of Rare Books for the New York Public Library, a position he has held since 2008. Prior to this appointment, he worked for six years as librarian-in-charge of NYPL’s Rare Book Division. He also served as a visiting professor at Pratt Institute from 2007 through 2012, where he taught courses on printing history, bibliography, and special collections librarianship. 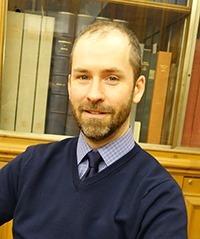 Michael is an active member of several bibliophilic and professional organizations, including the Grolier Club and Rare Books and Manuscripts Section of the Association of College and Research Libraries. In 2009, he was a recipient of Pratt Institute’s Alumni Achievement Award.